Thus far there’s only one painting of Japan featured on The Famous Artists. But, it is by one of their most famous painters and represents one of their most famous natural landmarks – Mount Fuji. Shibata Zeshin is one of Japan’s most famous artists. 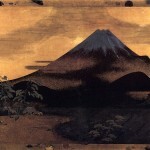 His landscape painting of Mount Fuji is somehow beautiful, yet haunting. Hopefully, as more Japanese artists are added to this site, there will be more wonderful paintings of Japan to share with you as well.